Ansonia senior Trinity Henderson drives into the Twin Valley South defense for a score during their Cross County Conference game on Thursday. The Tigers won the game, 51-38. Ansonia’s Kierra Reichert goes in for a layup against Twin Valley South on Thursday. The Lady Tigers won the game, 51-38. Ansonia’s Mariah Troutwine goes in for a layup against Twin Valley South on Thursday. The Lady Tigers won the game, 51-38. Ansonia’s Rylie Marker shoots a 3-pointer during a game against Twin Valley South on Thursday. The Lady Tigers won the game, 51-38. 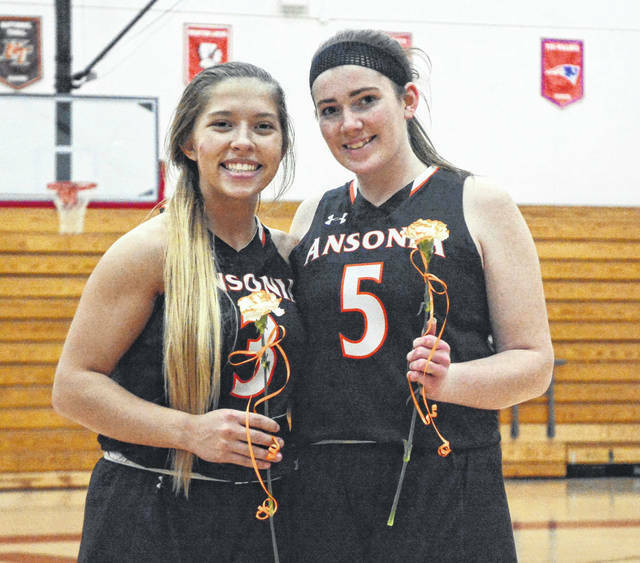 During its own Senior night festivities, the Twin Valley South girls basketball team also recognized Ansonia seniors Trinity Henderson (left) and Heidi Runkel. 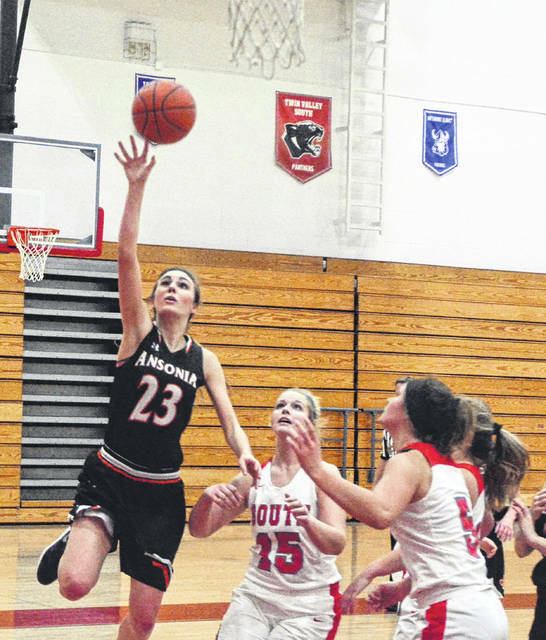 WEST ALEXANDIA – The underdog Ansonia Lady Tigers travelled to Twin Valley South and played the role of spoiler on Senior Night as they notched a solid win against the host Panthers on Thursday. 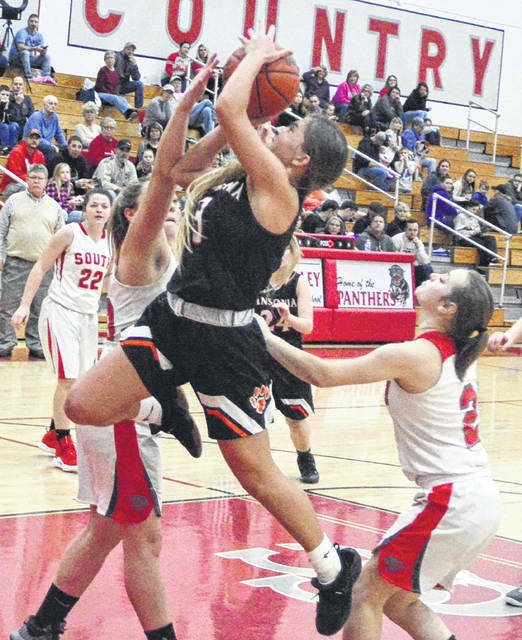 It was a close ball game at the half with South up by a point, but the Tigers got the lead for good in the second half and extended it in the last quarter for a 51-38 win. Both teams started with a zone. Ansonia was able to hit from outside and South was cold in the beginning. TVS went to a man-to-man defense in the second quarter and on offense began to hit their shots. 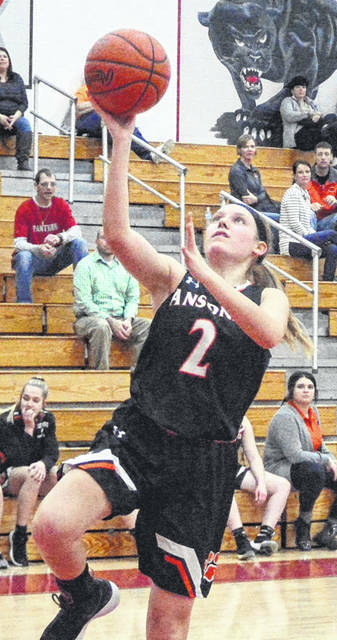 Ansonia fell behind, but closed the gap just before halftime with free throws from Kierra Reichert and Trinity Henderson to pull Ansonia to within one at 23-22. Both teams ran man-to-man defenses in the second half. This seemed to suit the Tigers best as they were able to get more turnovers and get more chances on offense. This was evident as South turned over the ball on their first four possessions in the half and Ansonia scored on three of those extra opportunities. 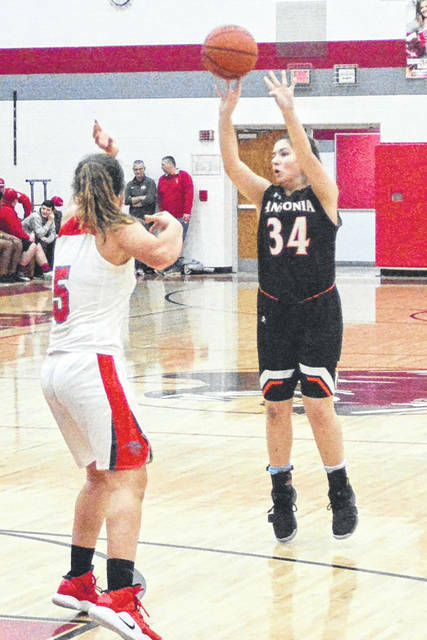 Ansonia had a 4-point advantage as the dueling teams went into the last quarter. Ansonia’s flex offense was adjusted and was generating good looks, meanwhile their defense got two back-to-back turnovers about midway through the quarter. Henderson and Reichert scored off of these steals and now it was a 10-point lead with about 3 minutes left. What had been a close game was suddenly in the Tigers grasp. South then went to the press which the Tigers were able to handle relatively well. South’s Lexi Bennet fouled out in the last minute. The Tigers did well from the foul line in the stretch with Rylie Marker, Trinity Henderson and Abigail Powers making their fouls shots when it counted extending the Tiger lead. “Any time you get a ‘W’ it’s good,” Bolin said after the game. “The girls came out strong in the second half and took over the ball game. We are a young team this year and we have struggled a little bit. It’s a win and better yet a conference win, so that makes it even better. Ansonia scoring: Trinity Henderson 22, Kierra Reichert 9, Rylie Marker 11, Mariah Troutwine 9, Emma Barga 1. The Tigers close out their regular season against Riverside and then will play in the state tournament on Feb. 23.